The ASX investor education team has been providing the essentials about share investing for over 30 years. 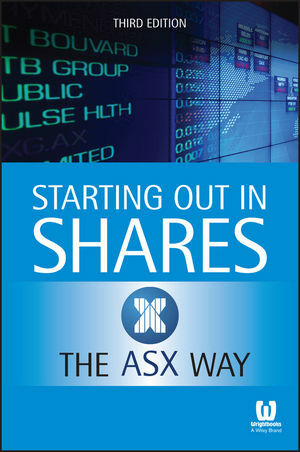 The latest edition of Starting Out in Shares the ASX Way is your one-stop resource to understanding what shares are—and how to buy and sell them. Inside, you'll have the pros and cons of shares over other investments explained. Many people don't know how the sharemarket actually works—the ASX team takes you through this. In easy to understand language, they will cover the process of investing including: effective ways to manage a portfolio, tried-and-tested stock selection methods, how to set yourself up for share investment, how to analyse shares and their prices and much more. If you want to explore the opportunities of share investing, you've come to the right place. If you're a would-be or beginner investor looking for trusted information on how to begin buying and selling shares on the Australian market, Starting Out in Shares the ASX Way will give you the confidence and knowledge you need to succeed. The Australian Securities Exchange (ASX) is one of the world's leading securities exchanges, offering a full suite of services from listings, trading, clearing and settlement across a comprehensive range of asset classes.